With GIS, officials view multiple georeferenced surveys at once and get a complete snapshot of the event. ArcGIS 3D Analyst and terrain dataset helped develop an accurate 3D representation of the town's surface terrain. Calculations are automated within the GIS, minimizing data preparation and maximizing time spent assessing flood-related issues. Images were created with real-time kinematic GPS bathymetric survey data of a storm water management pond and surrounding terrestrial DEM generated using lidar. The hydrology of landscapes surrounding urban areas is constantly changing due to the expansion of urban boundaries. As such, established and newly developing areas must implement cost-effective means for restoring or minimizing the impact of change while planning for future growth. 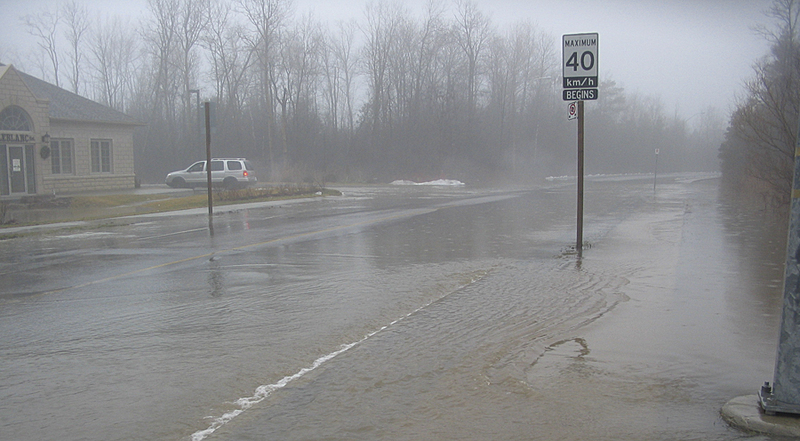 Among the many issues that can arise from increased urbanization, storm water management can pose significant challenges, particularly for municipalities located on floodplains. Situated in southern Ontario, Canada, the town of Cobourg is home to just over 18,000 residents and is rapidly growing. With four major creek systems that run southward through Cobourg to Lake Ontario, the town is especially vulnerable to flooding and has experienced several major floods over the past few years. Charged with mitigating the likeliness and impact of floods in Cobourg is the Ganaraska Region Conservation Authority (GRCA). The organization strives to conserve, restore, develop, and manage natural resources for 935 square kilometers of land. To better equip the town of Cobourg for ongoing expansion and subsequent flood risk, GRCA leverages GIS to simulate, test, and propose effective storm water management initiatives. It recently received a grant from the Ontario Ministry of the Environment's Showcasing Water Innovation Program that will be used to explore novel approaches to floodplain mapping that can be shared across the province. In strategizing to mitigate flood risk, GRCA is challenged to accommodate both existing and proposed development. "There are many heritage developments built on floodplains that simply would not be approved for construction today," says Ian Jeffrey, GIS/remote-sensing specialist, GRCA. "We're tasked with modeling the impact of potential flood events so that structures can be put in place to effectively mitigate risk in these areas." Concerns also arise over new development that may exacerbate flood hazards. The final fused hydraulic DEM with contours extracted to support the GRCA engineering department in its analysis of the hydraulic function of the urban storm water management system. "As development occurs across the landscape, sustainable management and appropriate planning are required to ensure that current and future actions do not degrade, alter, or destroy the existing environment," says Jeffrey. "When significant development happens in a small town, it is imperative to consider the bigger picture." For informed planning, GRCA applies classic principles of geodesign, using robust tools to design and evaluate structures that work in harmony with nature. This allows the town to meet goals related to both sustainability and regulatory compliance. The town has found that Esri's terrain dataset, along with the ArcGIS 3D Analyst extension, allowed staff to develop a digital elevation model (DEM), an accurate 3D representation of the town's surface terrain. The DEM is used to calculate floodplain elevations and map floodplain boundaries. Capturing this level of accuracy supports effective analysis so that recommendations can be made for the design and implementation of new storm water management infrastructure and detention ponds throughout the town of Cobourg. Detention ponds are storm water management facilities designed to protect against flooding and, in some cases, downstream erosion by storing water for a limited period of time and then releasing it slowly. They are also used to collect suspended sediments, which are often highly concentrated in storm water due to roadways and hard surfaces being washed off during rainfall. With four major creek systems that run southward through Cobourg to Lake Ontario, the town is especially vulnerable to flooding and has experienced several major floods over the past few years. These ponds are a necessary fixture of growing urban areas because flood events are often greater in magnitude and frequency within increasingly urbanized landscapes. Furthermore, surfaces associated with urban areas, such as roads, parking lots, and rooftops, prevent the natural infiltration of water into soil, which can potentially cause widespread flooding downstream. When analyzing existing or potential pond sites, GRCA leverages the ArcGIS 3D Analyst extension to incorporate multiple criteria into the decision-making process. This can include land availability, geographic conditions, and site-specific legal and jurisdictional considerations. Using GIS, it's also possible to evaluate the performance of a detention pond, including its attenuation efficiency (the ratio of runoff retained in a pond versus the amount flowing in), prior to construction. 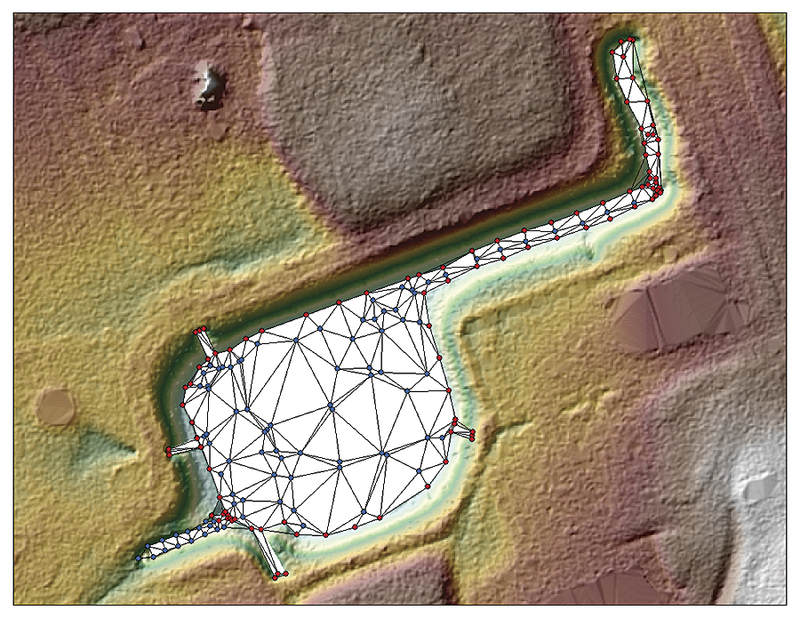 By visualizing lidar fused with GPS survey data, GRCA can also determine the amount of sediment accumulation within each pond that should be prioritized for removal. When new development occurs, the DEM is leveraged to forecast flow capacities along the floodplain and flag potential spill inundation areas that may require the implementation of new storm water management structures. 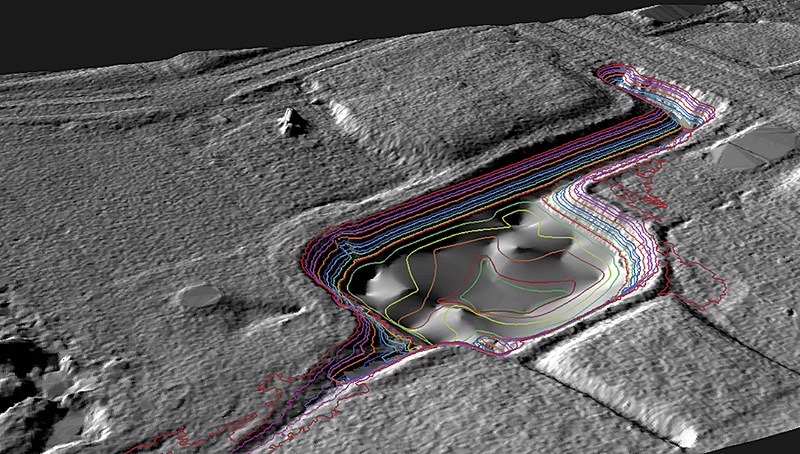 "We've created a living terrain dataset that can be exported at any time to produce an updated DEM," explains Jeffrey. "This means that we don't have to purchase new datasets every time new construction occurs, and we can use our existing model to analyze how water flows over the new terrain features." The updated DEM is used for both hydrologic and hydraulic analysis. GRCA first produces a hydrologic DEM, which is conditioned to support hydrologic models that simulate storm water runoff into watercourse features. The next step is to introduce hydraulic information in the form of in-stream 3D representations. To support hydraulic analysis, in-stream features are captured using real-time kinematic GPS and fused with the hydrologic DEM to produce a hydraulic DEM. Features such as top-of-bank breaklines, stream centerlines, and cross-sections provide the necessary 3D representation within river banks, which is typically not captured during DEM production. GRCA can then extract cross-sections from the hydraulic DEM and import them into a hydraulic model for engineering analysis. The results are used to estimate flow for storm water systems during various types of rainfall events. Floodplain maps are used not only to inform the development of storm management infrastructure but also to develop flood-related emergency response procedures. Because calculations are automated within the GIS, more time can be spent assessing flood-related issues, and less time is spent on the mechanical tasks of preparing data. Three-dimensional modeling using the ArcGIS 3D Analyst extension also makes it easier to communicate requirements with engineers and gain buy-in from stakeholders. For more information, contact Ian Jeffrey, GIS/remote-sensing specialist, Ganaraska Region Conservation Authority.